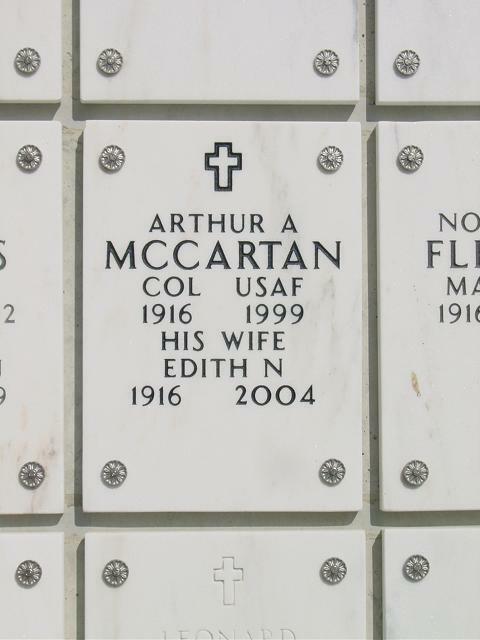 Retired Colonel Arthur A. McCartan, a former Air Force wing commander and director of the military branch's worldwide weather operations, died Saturday (February 27, 1999) at his home in Florissant, Missouri, after a brief illness. He was 82. Born in Barnesville, Minnesota, on Aug. 23, 1916, he graduated from West Point and went on to gain numerous awards and high-level posts during a 44-year career, in the military and at McDonnell Douglas Corp. In addition to a stint as director of operations at the Air Weather Service, he served as wing commander of air tactical forces in support of NATO and during the Cuban missile crisis. After his retirement from the Air Force in 1968, Colonel McCartan went to work at McDonnell Douglas Corp. In 1980, he worked on development of the advanced medium-range, air-to-air missile systems at McDonnell's facilities in St. Louis. Among the survivors are his wife, Edith, of Florissant; four daughters, Lucy Manheim of Fairfax, Va., Kathleen Spaulding of Tampa, Fla., Michele Wilson of Colorado Springs, Colo., and Janice Bond of Signal Mountain, Tenn.; eight grandchildren; and three great-grandchildren. The funeral service is pending at Arlington National Cemetery in Washington.